Pinot Grigio grapes originate from Italy, but Turning Leaf winemakers have discovered there are advantages to harvesting this popular varietal a little closer to home. California climate conditions, especially where Turning Leaf vineyards are located, are ideal for nurturing depth and flavor in Pinot Grigio. Throughout the growing season, a succession of warm days and cool nights prolongs hang-time by slowing down the pace at which Pinot Grigio grapes mature. Additional hang-time gives the fruit greater opportunity to develop character on the vine where it really counts. In addition, Turning Leaf winemakers can readily apply new learning and technologies to the making of their wines, a freedom that has resulted in Pinot Grigio as flavorful as it is refreshing. We traveled to Trentino, Italy in the foothills of the Italian Alps because of its unique quality to produce lush, flavorful Pinot Grigio. 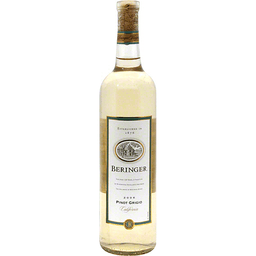 Our Pinot Grigio is full with the flavors of ripe pears, a creamy mid-palate and a long lingering finish. It's reminiscent of a pear cupcake with white chocolate. Enjoy with bay scallops in a cream sauce, linguini alfredo, or simply as an aperitif. Cupcake: live deliciously. -Adam Richardson, winemaker. Alc. 12.5% by vol. Product of Italy. Yellow Tail® Pinot Grigio 2016. 750 ml e. In the small Australian town of Yenda, the Casella family has been making wine for generations. It is here that [yellow tail] was created with a simple philosophy - to make great wines for everyone to enjoy. 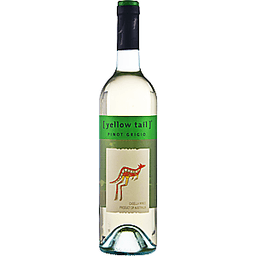 This [yellow tail] Pinot Grigio is everything a great wine should be - zesty, fresh and easy to drink. Flavors: Apples, pears and passionfruit. Enjoy: With Asian-inspired food on a warm summer evening. Contains sulfites. www.yellowtailwine.com. Alc. 13.0% by vol. Established in 1876. For over 125 years, a tradition of winemaking excellence has been the hallmark of Beringer wines. 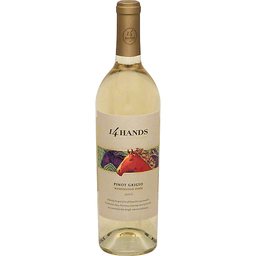 This carefully crafted wine offers refreshing aromas and flavors of citrus, melon and tropical fruit. Enjoy with a variety of seafood, light appetizers and white sauce pasta dishes. Barefoot Pinot Grigio blends have wow. Consistent quality, proven value. Gold! 2012 Consumer Wine Awards at Lodi. Pinot Grigio American: Barefoot Pinot Grigio is a crisp and refreshing wine with bright aromas and flavors of citrus and fresh green apple. Hints of Jasmine complement a bright, delicate, flavorful finish. Barefoot Pinot Grigio is a perfect match with poultry, seafood, spicy pasta, and pizza. Refreshing! barefootwine.com. Get Barefoot and have a great time! Alc. 12.5% by vol. White wine. Aromas of pear and Meyer lemon. Naked Truth No. 19: Naked is always the perfect fit. The Naked Grape won 65 gold medals & 338 awards. 3 liters is equal to four 750 ml bottles. Get green, get rewarded. Terracycle. 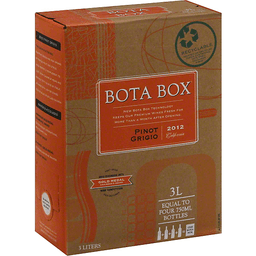 Thanks for picking up the only 3L box wine that is fully recyclable from bag to box! 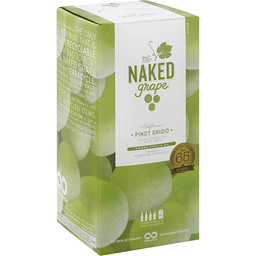 The Naked Grape has teamed up with Terracycle to eliminate the idea of waste! Once you've finished enjoying this wine, send the package back to Terracycle to recycle our packaging into cool recycled items. Visit www.terracycle.com to get a free shipping label to send back this packaging, start a collection brigade and earn rewards for your waste. Stays fresh for 4 weeks after opening. Have you ever met someone and knew right away you could be close friends? The kind of person you feel both comfortable with and excited by at the same time? That wonderfully naked friendship is how we like to describe its go every where wine - our light bodied pinot grigio seems to go with just about anything and make it all just a bit more fun. 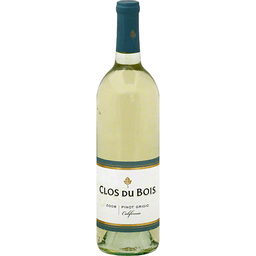 With aromas of pear & Meyer lemon, it's got a crisp, fresh, light and tangy style. So let's raise a glass to life, laughter and those who make all occasions a good time. Bare it all. thenakedgrapewine.com. Alc. 12.5% by vol. Packed by Grape Valley Wine Company, Modesto, CA. Chairman's best of class! Long Beach Grand Cru 2011. Barefoot's Pinot Grigio blends have won with consistent quality proven value. 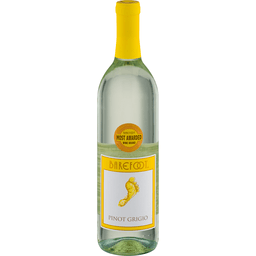 Barefoot Pinot Grigio is a crisp and refreshing wine with bright aromas and flavors of citrus and fresh green apple. Hints of jasmine complement a bright, delicate, flavorful finish. Barefoot Pinot Grigio is a perfect match with poultry, seafood, spicy, pasta and pizza. Refreshing! Get Barefoot and have a great time! Alc. 12.5% by vol. Vinted and bottled by Barefoot Cellars, Modesto, CA 95354. The refreshing Pinot Grigio originates in vineyards located at the foothills of northern Italy's spectacular Alps, home of some of the world's finest Pinot Grigio. With over a half-century of winemaking expertise and a passion for quality, Cavit proudly presents this remarkably versatile wine. Elegant, crisp and refreshing, with a delicate floral aroma and flavors of citrus, apple and pear, it is best enjoyed well- chilled. Salute! 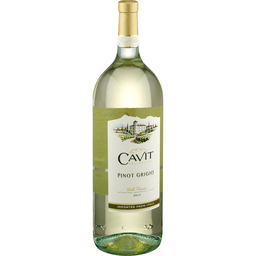 The Cavit winemaking team proudly presents this exceptional Pinot Grigio from the award-winning Cavit Collection. Anselmo Martini, Chief Enologist, Cavit. cavitcollection.com. Alc. 12% by vol. Produced & bottled by Cavit S.C. Trento, Italia. Palm Bay International. Imported from Italy. Product of Italy. By Robert Mondavi. In 1979, Robert Mondavi founded Woodbridge Winery near his childhood home of Lodi, California to craft wines for everyday enjoyment. Our Pinot Grigio is a light, crisp wine displaying juicy flavors of lime and citrus leading into a mouthwatering finish. To learn more, visit www.woodbridgewines.com. Wine to me is passion. It's family and friends. It's warmth of heart and generosity of spirit. - Robert Mondavi. Free range. Giant 47 pound rooster. At the turn of the century, HRM (his royal majesty) Rex Goliath was a treasured circus attraction. Weighing in at 47 lbs, Rex was billed as the world's largest rooster. 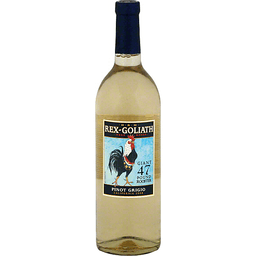 Our wines are a tribute to Rex's larger than life personality with big, fruit-forward flavors sure to please. Bright, juicy and floral - say howdy to our California version of this Italian classic: cultured but racy, and very romantic. Alc. 12.5% by vol. 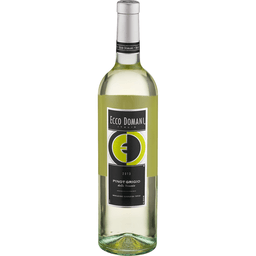 Ecco Domani® 2013 Pinot Grigio. Italia. Alc. 12.5% vol. Style. Elegance. Sophistication. Inspired by the allure of modern Italy, I create wines from some of the finest vineyards in Italy's renowned Tre Venezie region. Ecco Domani Pinot Grigio showcases delightful floral and tropical fruit aromas, with a flavor that is elegant and crisply refreshing. 750 ml. Learn more about how Ecco Domani helps launch the careers of aspiring fashion designers through the Ecco Domani fashion foundation at www.eccodomani.com. Fabrizio Gatto winemaker, Ecco Domani. ©Ecco Domani USA 2008. 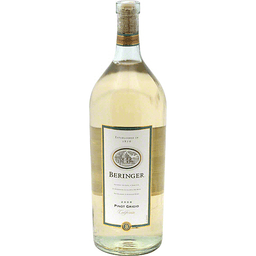 Light bodied and crisp with aromas of pear, lemon, and honey. Alc. 12.5% by vol. Vinted and bottled by Grape Valley Wine Company, Modesto, California. Established in 1876. For over 125 years, a tradition of winemaking excellence has been the hallmark of Beringer wines. 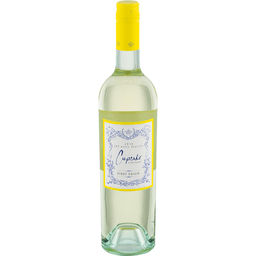 This carefully crafted wine offers refreshing aromas and flavors of citrus, melon and tropical fruit. Enjoy with a variety of seafood, light appetizers and white sauce pasta dishes. Alcohol 11.5% by volume. Established 1124. For centuries the Gabbiano Knight , or Cavaliere, protected the Castello di Gabbiano Estate and today embodies the tradition of winemaking excellence. The Pinot Grigio grapes for this wine came from th northeastern corner of Italy's Delle Venezie region, the finest area is in the world for producing Pinot Grigio. 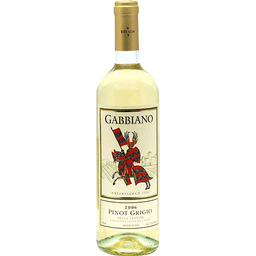 Gabbiano Pinot Grigio is light and crisp, with flavors of citrus and melon. Enjoy with a variety of cuisine, including chicken, seafood and pasta salad. Alcohol 12.5% by volume. Product of Italy. Celebrating the spirit of the wild horses that once roamed the Columbia River Basin. These horses, measuring a mere 14 hands tall, were renowned for their strength, endurance and tenacity. 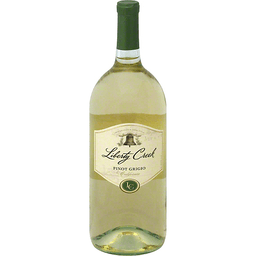 This crisp, refreshing Pinot Grigio has aromas of fresh melon and green apple that are followed on the palate by flavors of pear and honeysuckle. A great pairing with your favorite seafood. 14 Hands celebrates the spirit of the wild horses that once roamed the Columbia River Basin. Fourteen hands in height, these tough little horses were revered around the world for their strength. The terrain that once gave them endurance and spirit now feeds our vines. Our 14 Hands wines share the soul and intensity of this unbridled freedom. Artist Cynthia Sampson. 14hands.com. Alc. 13.0% by vol. Cellared & bottled by 14 Hands Winery, Paterson, WA, USA. Family owned & operated. 1933 founded. It's pretty simple really. We're an American family that's been making quality wines for American families since 1933. 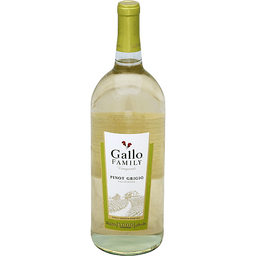 For four generations, Gallo Family Vineyards has been dedicated to giving you the best tasting wines at the best tasting price. We call it our best taste promise. Learn more about our best taste promise at www.GalloFamily.com or call toll free: 1-877-425-5696. 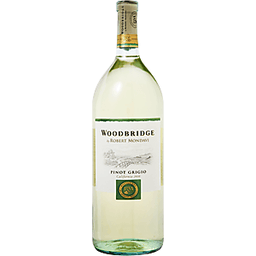 Our Pinot Grigio brings together refreshing crispness with bright flavors - fresh green apple, white peach and citrus. Alc. 11.5% by vol. California reserve. Borrowing on over 75 years of fine winemaking experience, each Livingston Cellars blend delivers impressive quality that consistently surpasses expectations. 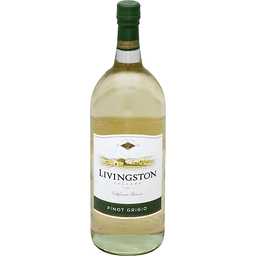 Easy to enjoy and share with others, Livingston Cellars is the perfect wine to bring friends and family together in toasting all the best moments life has to offer. www.livingstoncellars.com. Alc. 11.5% by vol. Vinted and bottled by Livingston Cellars, Modesto, CA. Free range. Giant 47 pound rooster. The legend of Rex-Goliath. At the turn of the century, HRM (His Royal Majesty) Rex Goliath was a treasured circus attraction. Weighing in at 47lbs, Rex was billed as the world's largest rooster. 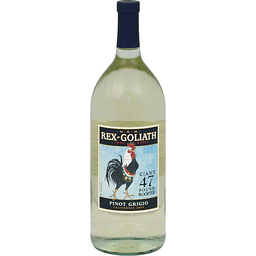 Our wines are a tribute to Rex's larger than life personality with big, fruit-forward flavors sure to please. Bright, juicy and floral - say howdy to our California version of this Italian classic: cultured but racy, and very romantic. Alc 12.5% by vol. Product of USA. Smooth as silk? Fresh and lively, our Pinot Grigio has fragrant notes of pear, melon, flowers and spice that are characteristic of this Northern Italian grape grown in California soils. Unique to Pinot Grigio you will experience an elegant silkiness on the palate, which is said to come from the invisible pigment of this grape variety. Alc. 13.5% by vol. 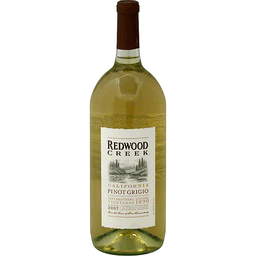 Redwood Creek represents the adventurous spirit of California and consistently delivers a rich, flavorful experience at an attractive price. 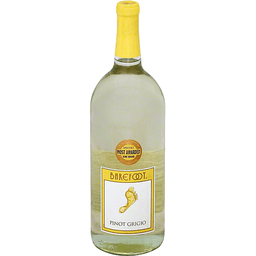 The 2007 Pinot Grigio is juicy and fruity with an excellent acid balance. Notes of ripe red apple, peach and citrus flavors dance on the tongue making this an enchanting wine to pair with food or drink by itself. Premium wine of California. Committed to crafting premium wines since 1978. Crisp & refreshing with classic citrus & floral notes. 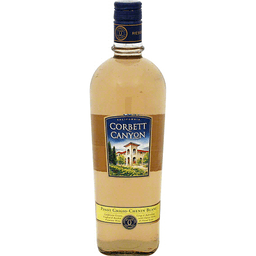 Founded in 1978 in a hacienda-style winery, Corbett Canyon's award-winning wines have consistently delivered outstanding value. 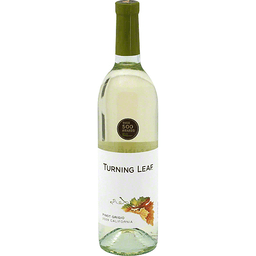 This medium bodied white wine has classic citrus notes and a satisfying, crisp finish. Enjoy with chicken, seafood and light salads. Alc. 12.5% by vol. Cellered and bottled by Corbett Canyon Vineyards Ripon, CA. Grapes for our Pinot Grigio are sourced from the Delle Venezie region of Italy. Located in the northeast, Venezie stretches from rich farmland in the Po River delta to the foothills of Venice all the way to the Alps. The northeast grows a staggering variety of grapes, including the wildly popular Pinot Grigio. 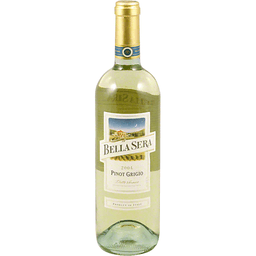 Bella Sera's Pinot Grigio is crisp and refreshing with citrus aromas and flavors of ripe apple and pear. It is excellent before dinner and with light pastas, herbed chicken, and fish. This refreshing Pinot Grigio originates in vineyards located at the foothills of northern Italy's spectacular Alps, home of some of the world's finest Pinot Grigio. With over a half-century of winemaking expertise and a passion for quality, Cavit proudly presents this remarkably versatile wine. Elegant, crisp and refreshing, with a delicate floral aroma and flavors of citrus, apple and pear, it is best enjoyed well-chilled. Salute! 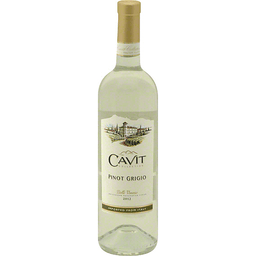 The Cavit winemaking team proudly presents this exceptional Pinot Grigio from the award-winning Cavit Collection. Anselmo Martini, chief enologist, Cavit. cavitcollection.com. Sole US agent. Alc. 12% by vol. Produced & bottled by Cavit S.C. Trento, Italia. Imported from Italy. Product of Italy. Our Pinot Grigio opens with seductive floral and lemon aromas, followed by notes of mineral and tropical flavors. The wine has a clean, crisp finish, making it a versatile accompaniment to grilled trout, herb chicken or spicy dishes. Alc. 13.0% by vol. At Liberty Creek we craft our wines upholding the ideals of a bygone time. A time when traditions were esteemed and principles were hard-won. Our long tradition of winemaking is rooted in the rich soils of California. And every bottle of Liberty Creek rings faithful to the principle we hold true - that quality wines should be accessible for all. 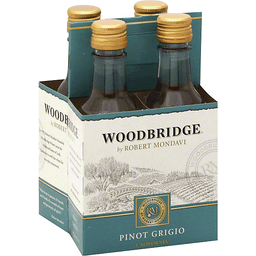 Our Pinot Grigio is light-bodied with hints of citrus fruits and notes of ripe apple. Pairs perfectly with light pasta dishes and fresh green salads. Contact us: 1-877-588-2783. www.libertycreekwines.com. Alc. 11.5% by vol. Vinted & bottled by Liberty Creek Vineyards Modesto, CA 95354.